Last week, Shot of Brandi and Shot of Mom were challenged to come up with 30th birthday party themes. I never turn down a challenge, so I did some internal brainstorming and here’s what I came up with! · Attire: Those gals and guys into themes shouldn’t have a tough time finding something to wear to this party (see retailers above). For those that like to do the minimal to participate can add neon bracelets or necklace. Easy, right? · Décor: Go nuts at Oriental Trading. They have neon everything – including glow bracelets, necklaces and balloons. Easy again. · Drink: Brands like DeKuyper make it easy to create bold drinks and jello shots. Don’t forget some three olives Dude. Image sources: Asos sequin bow dress (on sale! ), Sequin Bowties, Bow invite via Paperless Post, Emergency Bow Ties via me! 2. Sequins & Bows: This is a VERY Shot of Brandi* theme (pretty much describes my whole closet), but almost anyone can pull this off. · Attire: Pretty self-explanatory here: sequins and bows. Girls likely already have something in their closet. For the guys, this can mean bow ties. · Décor: I’m a bit over the whole moustache trend (sorry), BUT I’ll allow an exception here. Add bows to balloons and on centerpieces. You can also buy some inexpensive sequin trip to add as a table runner or around vases. · Drink: This party calls for some bubbly in bow adorned wine and martini glasses. For the guys, whiskey drinks. 3. Let’s Have as Much Fun as Two 15-Year-Olds: Okay, this theme is a mouthful, but I saw this slogan on a birthday card and couldn’t stop thinking of the possibilities. · Décor: Throwback photos from your 15-year-old days. I’m sure some St. Ides Special Brew would make an appearance in my images. · Drink: This is where the fun starts. I’m not sure they still make that Special Brew, but I know they still make Mad Dog. Add in Peach Schnapps, some cans of Natty Light and Keystone and you’ve got a Bowling Night party right there. I also recommend adding some big kid drinks. You likely can’t recover like your 15-year-old self. 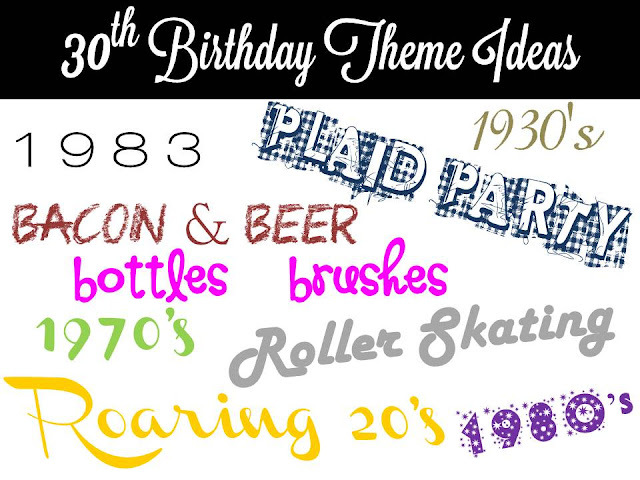 · Decade themes: 80’s, 90’s, etc.